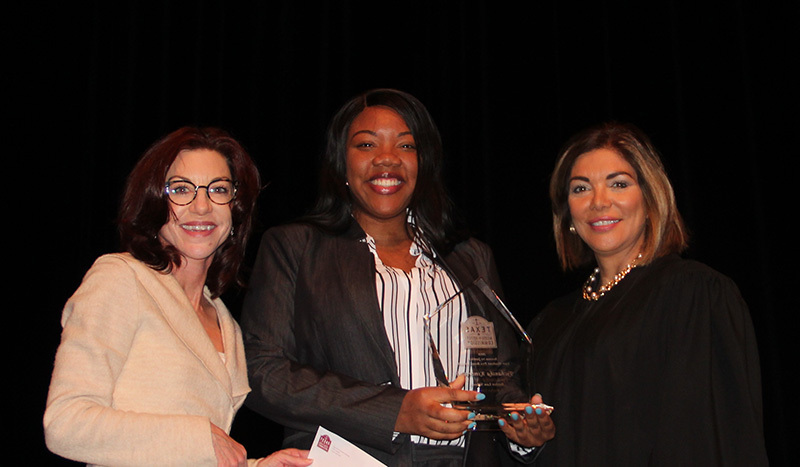 AUSTIN, Texas - The Texas Access to Justice Commission (TAJC) announced the 2018 Law Student Pro Bono Award winner is Tychanika Kimbrough of Baylor Law School. The 2018 Law School Commitment to Service Award goes to SMU’s Dedman School of Law. The Law Student Pro Bono Award recognizes a Texas law student who demonstrates a commitment to the delivery of legal services to low-income Texans and a passion for advocating on behalf of the underserved. Nominations were received from Texas law school students and faculty, as well as nonprofit legal service providers who work with these students in a range of client services settings. The award includes a $2,000 stipend. The Law Student Pro Bono Award nominees this year were exceptionally worthy, and the selection committee recommended several special commendations in addition to honoring Ms. Kimbrough. Tychanika “Tycha” Kimbrough graduated from Baylor Law School in July of 2018—and letters in support of her nomination shared examples of focus, positivity, and commitment to serving the community. Ms. Kimbrough grew up in the care of her grandparents in San Antonio’s Dellcrest neighborhood, where the average household incomes are below $40k a year. She has often shared her goals of returning home to use her law degree for the community. Her law school volunteer work with veterans, juveniles, immigrants, and clinic clients reflected over 225 pro bono hours, none of it for course credit. Baylor Law School recognized her with their Public Interest Fellow designation, the highest distinction of its kind for pro bono and community service. The Director of Baylor Law Schools Veteran’s clinic called Tycha Kimbrough the “happy warrior” of this year’s clinical program—and her service to those who served earned the respect of the 2018 award selection committee. The Law School Commitment to Service Award recognizes a law school that has distinguished itself by actively educating its students about access to justice and making significant and innovative strides to increase access to justice efforts. The faculty and staff and students at SMU’s Dedman School of Law have raised the bar this past year—excelling at making engagement in pro bono a priority. In 1947, SMU’s School of Law was among the country’s first to sponsor a community legal clinic. Now low-income and under-represented communities in the Dallas area benefit from the law school’s ten clinics: the Civil Clinic; the Criminal Justice Clinic; the Federal Taxpayers Clinic; the Small Business and Trademark Clinic; the W.W. Caruth, Jr. Child Advocacy Clinic; the Consumer Advocacy Project; the USPTO Patent Law Clinic; the Vansickle Family Law Clinic; the Judge Elmo B. Hunter Legal Center for Victims of Crimes Against Women; and the Actual Innocence Clinic. These clinical programs equip and encourage students to continue to provide pro bono assistance long after they graduate. One of the nominations submitted for Dedman School of Law was from a nonprofit partner who wrote at length about the exceptional work done (through the Civil Clinic) for victims of Hurricane Harvey/severe flooding in the Rio Grande Valley in 2017 and 2018. Dedman School of Law was also the first law school in Texas to make law-related public service a graduation requirement. After two decades of this requirement, the total number of law-related volunteer hours from Dedman School of Law students has passed the quarter million mark. New programs and opportunities reflect a law school that remains committed to the ideals that have shaped it from the beginning: public service, professional responsibility, and outstanding skills training. A new course, "Technology, Innovation, and Law: Designing Legal Apps," gave Dedman law students the opportunity to use digital tools to help the disadvantaged. Students partnered with a Texas legal services agency to create web-based apps that could help serve clients of that organization. Students working with the Force for Immigrant Rights and Empowerment developed an app in both English and Spanish to advise people of their legal rights during encounters with law enforcement officials. Justice for All is a part of the past, present, and future of SMU’s Dedman School of Law. Their rich history of pro bono work is added to with each passing year—and they earned this year’s Law School Commitment to Service Award for the exceptional accomplishments noted in multiple nominations.